Quick Review of "The Singer Takes It All"
On The Singer Takes It All, performers are placed on a moving conveyor belt and are judged by the home viewers via the show’s app based on their singing abilities. If a majority (more than 51%) of the viewers vote “Hit”, the contestant moves toward and into the Gold Zone. If a majority vote “Miss”, the contestant moves back toward the exit doors. 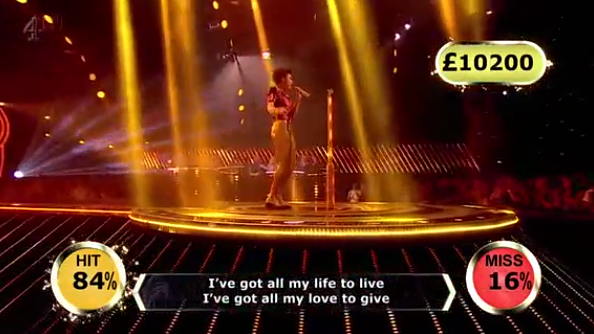 The contestant who lasts the longest in the Gold Zone becomes the champion and advances to the end game, where he/she must sing a randomly selected song and is reward £200 for each second they are in the Gold Zone up to £15,000. This show is virtually filled with tons of necessary energy from start to finish, especially with the outgoing and vivacious Alan Carr at the helm. The Singer Takes It All has the same appeal that has made The Winner Is a popular format across the globe. It’s definitely one of the most engaging new shows of 2014 with reasons including the live broadcasting with real-time voting and instantaneous poll revealings, the ‘instant video auditioning’ feature within the app, the brief performances and returning champions — one game show element that is interestingly making a slow and gradual comeback. On the premiere episode, over two million viewers voted Hit/Miss throughout the show via the show’s smartphone app. The show’s app also creatively allows users to instantly apply and audition for the show by recording a quick clip of their singing abilities. Unfortunately, the one major drawback lies solely within the mobile app. According to multiplesources, several viewers had run into technical difficulties while attempting to vote through the app. It seems like the same issues NBC’s The Million Second Quiz had seen last year when millions of users were unable to play-along with the show with the app during the first couple of nights. 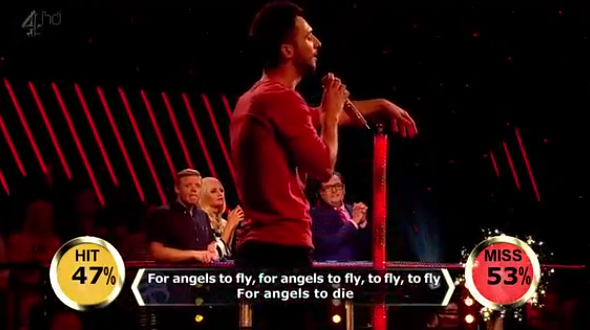 This technical issue is a more serious problem for The Singer Takes It All because its format heavily relies on viewers using the app to ultimately decide the fate of the contestants, especially during the £15,000 end game. Other than that, this show is enjoyable to watch and I believe there is a chance that it could be renewed for a second series. The Singer Takes It All is the type of amateur talent game show at encourages anyone and everyone to sign up and apply (similar to The Gong Show without the absurdity) without having a sad or heart-felt backstory like one would see on The X-Factor or The Voice. This show is also a good test of performers’ confidence and singing under pressure. It’s a fun game show that’s great for anyone of any age group to watch and enjoy (although, it will take a while to get used to Carr’s disembodied co-host, “Lips”). Next Post Quick Review of "The 21st Question"